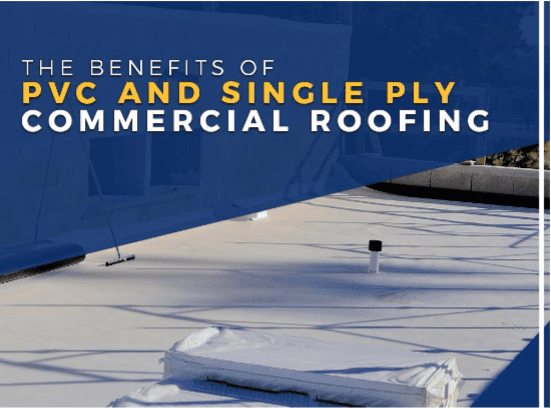 When it comes to commercial roofing, you need a system that can handle whatever nature throws at it—your business literally depends on it. PVC and single ply roofing are among the most popular roofing types used in commercial buildings due to their durability and longevity. Recyclable: PVC roofing is 100% recyclable. It’s the green roofing option of choice for business owners who put a premium on sustainability. Sustainable: Thanks to its lifetime weldable quality, PVC roofing can be modified. As a result, it can handle solar panel installation and other modifications to improve its sustainability. Durable: PVC roofing has a long life expectancy compared to other roofing types, making it a cost-effective solution. Lightweight: PVC roofing is as light as they come. The advantage of a lightweight roof is that it’s easier and thus less expensive to install and doesn’t put undue pressure on the structure of the building. Supreme Protection: Single ply roofing does exceptionally well under acid rain. As such, you won’t have to worry about waterproofing during extreme weather conditions. Highly Reflective: By reflecting sunlight rather than absorbing it, single ply roofing helps maintain a comfortable indoor temperature, improving your energy efficiency and cutting down on energy costs. Affordable: Single ply roofing is one of the most affordable commercial roofing options. With proper maintenance, it can protect your building for many years. Complete Exteriors, LLC. is the commercial and residential roofing specialist you can depend on. You’re sure to get expert assistance throughout your project when you work with us. We serve Brandon and Jackson, MS. Call us today at (601) 533-8154 for a free estimate.